Welcome to CDM Baseball Boosters Fundraising Page!! We strive to raise funds to support our Varsity, Junior Varsity and Freshman teams. In addition to using our funds to expand our coaching staff, a majority of funds raised are used for field and scoreboard maintenance as well as equipment purchase and repairs. In years when funds allow, we have not charged families and players to attend our Year-End Banquet. Last year we provided hats to all players. Our major fundraiser each year is the selling of ads for our annual year book. In an effort expand our fundraising efforts, 6 years ago we began the tradition of our Parents Night Out. Each year has been a great experience!! Please click the link below for more information and to purchase tickets or underwrite our March 30th fundraiser! Traditionally we have sent the boys out to ring doorbells for our Neighborhood Blitz - last year we brought our Blitz to the internet in an effort to fundraiser outside of Newport Beach!!! It has been an overwhelming success! Thank you to all the friends and family who donated almost $20,000 this year!! !Please click the links for more information and to support our programs!! Field Renovation Fundraising - join the CDMHS Stadium Club!! Thank you to all who have "donated" a seat!!! We are reaching out for your help in order to properly recognize the great program that CDM baseball has been over the last 50+ years. 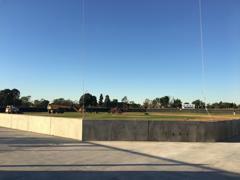 The NMUSD has completed phase 1 of our field renovations that included removal of the old backstop and sideline fencing, building a new concrete backstop in a better location and installation of field netting extending higher and farther down the baselines to better protect our school, students, visitors and vehicles. 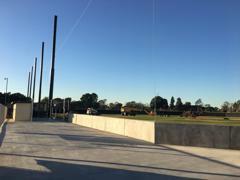 The relocated backstop has also expanded the seating area for our spectators. 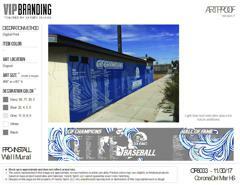 Before the 2018 season CDM Baseball completed a special fundraising effort in order to cover the 2nd phase of beautifying the baseball field and commemorating the great teams and players of the past. This phase included installation of padding on the new backstop and dugout fencing, replacing the windscreen surrounding the entire field and installing a "Wall of Fame" where every player and coach from the 3 C.I.F. Championships, as well as the individual Hall of Fame members, have been permanently recognized. C.I.F. Championship recognition is now on the outfield wind screen as well. We have now reached the final phase which involves upgrading seating for fans. We are now raising the last $24,000 to install approximately 100 stadium seats at our new beautiful field. We are now giving our fans the opportunity to "purchase" a stadium seat. Your donation of $500 will be memorialized with a "Donated by.." plaque on one stadium seat while a donation of $800 will memorialize two seats! This project will not happen without your financial support. The Corona del Mar Baseball Foundation is a registered 501(c)(3) non-profit and every donation is 100% tax deductible and unlike most charitable foundations, 100% of every dollar goes directly to the project. We have no administration costs at all. Please send your checks in to “The Corona del Mar High School Baseball Foundation” c/o Donna DiFerdinando, 900 Aleppo St., Newport Beach, Ca. 92660. You may also click the link on the left to donate securely via PayPal. We REALLY! Need your help to get this project done!! We will keep you posted on our progress!! If you own or work for a business and want to get them involved that would be great. Let’s do this!!! NOTE TO FAMILIES OF CURRENT YEAR PLAYERS: THIS CAMPAIGN IS SEPARATE AND APART FROM OUR NORMAL FUNDRAISING EFFORTS AND PLAYERS WILL STILL BE ASKED TO FUNDRAISE TO COVER OUR NORMAL ANNUAL EXPENSES.